FRANKLIN LAKES – It is not enough for an opposing defense to use the out-of-bounds markers as relief from Ramapo’s attack. Defenses that opt to play the ball over the lines instead of finding the connections to carry it the other way play right into Ramapo’s hands (and feet). 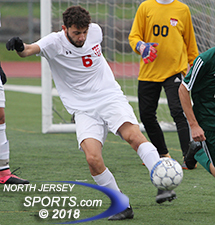 The Green Raiders are deadly on restarts and got plenty of chances to put them on display against Morris Hills on Monday in the North 1, Group 3 state sectional semifinals. 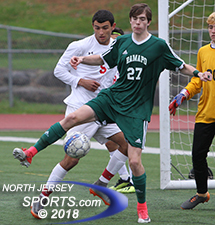 Ramapo earned two corner kicks and three throw-ins, which are catapulted into the penalty area by Colin McKenna, inside the offensive third in just the first five minutes of the game and set the state for what was to come. Senior Matthew O’Shea was the one to convert first as he knocked a free kick into the upper left hand corner of the net from 25 yards out midway through the first half to open the scoring and he was just getting started. The senior midfielder netted a hat trick and assisted on Ramapo’s other goal in a 4-0 victory that sends the Raiders into Thursday’s section final where they will visit top-seeded Paramus, a 2-1 winner over Montville in Monday night’s other semifinal. Morris Hills’ season ended with a 13-7-2 record and after a quarterfinal upset of third-seeded Wayne Hills. O’Shea certainly kept it up as, just two minutes after opening his account, he his second goal of the game through the run of play. Gliding with possession across the top of the box, he tucked a shot inside the near post to make it 2-0, the same lead that Ramapo took into halftime. Morris Hills, the No. 6 seed, brought some positive playoff mojo into the match. The Scarlet Knights scored in the final 40 seconds of regulation to tie Sparta in the opening round before winning that game in double overtime and then pulled the upset of No. 3 Wayne Hills in a quarterfinal penalty kick shootout. In this match however, Morris Hills was unable to get much time on the ball. Ramapo goalkeeper Jeremy Andreoli, who made the save in the final penalty kick round sealed the Raiders quarterfinal win over Roxbury, had much less to do. He touched the ball only a few times behind the well-organized Raiders defense anchored in the middle by Ian Chesney. Ramapo assistant coach Frank Rocchio called the effort “the best game we have played all year,” while head coach Evan Baumgarten put that thought into proper soccer parlance. Aidan Bennett-Jones scored the third goal for Ramapo, which will play top-seeded Paramus in the section final on Thursday. Ramapo, while in control for most of the second half, too, did not extend its lead until the clock ticked down under 14 minutes. That was when Aidan Bennett-Jones got in up the right hand side and cut a shot back across and inside the opposite post for a 3-0 lead. O’Shea finished off his hat trick and the game’s scoring in the 69th minute. O’Shea received the ball with his back to goal and then spun and fired into the upper left hand corner with 11:52 left. O’Shea, who was a key piece in Ramapo’s county championship and state sectional finalist set up last year, knows the clock is ticking on his high school career and wants to keep it going for as long as possible.